This upscale (some might find it even quite pricey) restaurant is located in Tanjung Rhu and inside the Four Seasons Resort. Being part of a five star resort it is expected that the prices will be high, however it is more than compensated by the sheer elegance, quality of food, wonderful views of the ocean & lush plantation, as well as superlative service. The word 'Ikan' stands for 'Fish'... so when you see a name 'fish fish'... you get to feel that this restaurant must be all about best fish or seafood dishes in the island. Well there is no doubt about that... however the restaurant also offers excellent meat, chicken as well as vegetable dishes. As you approach the restaurant, you can see that it is laid out in a traditional Malay home like structure at an elevated level. You will need to climb a few wooden steps to get to the pavilion which is the main dining area but open in all sides. Depending on the table you choose, you can either get sweeping view of the ocean (better viewed when there is still daylight) or lush greenery. The comfortable wicker chairs and wooden tables, teak wood finished floors, slanted tiled roofs and wooden structures all around give you an authentic feel that you are in an upscale traditional Malay home. 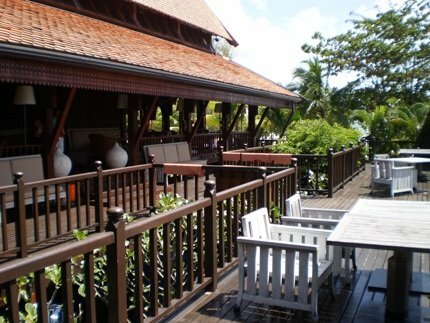 Just outside the main dining area there is an open wooden terrace or a deck. This is where you can dine in the open air under the starlit sky. Inside the main dining area, there is also a section for a sophisticated cocktail bar with spectacular view of the water. And there is also a private dining area. The capacity of the main dining area (which is alfresco and open on the sides) is 50 with 16 seating in the cocktail bar area and rest in the main pavilion. The open deck outside can accommodate 10. So what should you order? ... Actually plenty to choose from. More the number you have in your group, more number of delicious dishes you can order and share among yourself. The restaurant specializes in South East Asia's regional specialties, and make dishes from contemporary local cuisine to age-old recipe from the rural villages in the island and Malaysia. In appetizers you have a choice of chicken salad in a wrap served with chili coconut dip, or calamari salad, crab meat salad or soup, beef skewer, crispy prawn curry with potato, chicken satay etc. If you are a seafood lover (one of the main reasons you should be here for), you can try out one of their signature dishes such as grilled green lobster, wok fried spicy tiger prawns, fried red snapper fillet... etc, but one of the favorites is slow cooked crab curry served with papaya and homemade spices. Other signature dishes includes sambal sotong and ikan kerapu asam pedas prepared with catch of the day (tip: these are local favorites). In meat some of the items to go for are the Rendang (grand mother style beef), or the sliced beef or tenderloin... one of our favorites here is the slow roasted short ribs or even the grilled lamb rack. If you are more into chicken, try out the traditional Malay chicken curry mixed with raisins and cashews. There are several great vegetable items including wok fried mixed vegetables, fried green beans etc. And to accompany all this with some staple food, you have a nice choice of rice and noodles including chicken & egg fried rice, fragrant steamed rice, wok fried noodles with chicken & prawn and more. If you love desserts, then there are plenty in the offer too. Try out either the deep fried banana in palm sugar glaze, or the mango pudding, or one of the homemade ice creams. 6:30pm to 10:30pm (open only for dinner). The restaurant is usually not open on all days of the week (usually closed on Wednesdays and Saturdays). But check with the hotel before you make a booking. You should book in advance. Outside guests are also welcome. While you can call up and make a table reservation, you can also book a table online through the hotel's website. Four Seasons Resort is located in Tanjung Rhu area at the northern coastline of Langkawi.